Goodreads says, "She thought she’d lost everything . . . After spending months traveling the harsh, unforgiving Mesopotamian desert, Jayden reunites with a broken, injured Kadesh. Although everyone was convinced the violent and unpredictable Horeb, Jayden’s betrothed, killed the handsome prince, Jayden knew in her heart that her love was alive and safe. But their reunion is short-lived, as they learn Horeb is on their trail and determined to take back the girl he has claimed. Soon, the two star-crossed lovers are on the run toward Sariba, Kadesh’s homeland, where, as heir to the Kingdom, he plans to make Jayden his princess. But the trek to Sariba is fraught with heartache and danger. After narrowly escaping being stoned to death for a crime she didn’t commit, and learning that her sister has disappeared, Jayden’s only solace is her love for Kadesh. But even he is keeping secrets from her . . . secrets that will change everything. This gorgeous and enchanting sequel to Forbidden, is full of love, danger, and heated passion that will leave readers breathless." Banished picks up where Forbidden left off and we are reunited with Jayden who has decided to search for Kadesh. There are rumors that he may not have survived the attack from Horeb, but she comes to find him after a long trek and he is indeed injured and scarred. Jayden hoped that they would be reunited and this would fix all of her problems, but Horeb is still on her trail and doesn't plan on giving up anytime soon. Kadesh and Jayden's only option is to return to Sariba, where Kadesh is from, and then hopefully they can be together. But Kadesh knows that Horeb is not likely to give up and is recruiting a large army; war is immenent. To complicate matters further, Jayden experiences many troubles in this sequel to Forbidden. She is dealing with trying to find her missing father, there's also her aging grandmother's welfare, her sister's involvement with the Temple of Ashtoreth, and ultimately, there are many secrets that Kadesh is hiding from her. Kimberley G. Little's second installment in the Forbidden series is a breathtaking adventure through the Mesopotamian desert; there's romance, danger, a lot of action, and historical details that all added to my enjoyment. I really liked Jayden in Forbidden and I continued to do so in Banished. She's a tough girl and one that often deals with a myriad of problems. 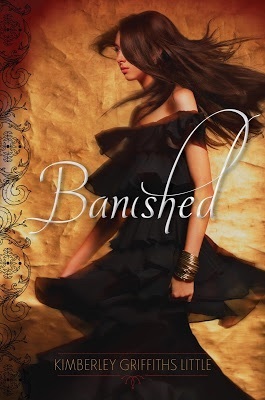 She really couldn't catch a break in Banished, but that definitely added to the book's suspense. As in the first book, I continued to love her relationship with her grandmother as well as her father; the politics of her tribe also interested me. Unfortunately, Horeb, her betrothed and also a dangerous killer, is hot on her trail and just won't give up. Although we don't see too much of him in Banished, his ominous presence is always felt as Kadesh, Jayden and company are always trying to be one step ahead of him. The romance between Kadesh and Jayden was also well done in Banished. However, the course of true love never ran smoothly, right? There's some secrets about Kadesh that are going to come to the surface and Jayden will have to deal with the many different things thrown her way once she is in his homeland. The historical details are fantastic in this novel. I'm not sure they are entirely accurate, but I loved the enchanting, yet dangerous world of the Bronze Age and the desert. The role that females played in this society was a tough pill to swallow, but that made me root for Jayden even more. So, if you enjoy historical fiction and you want something new and fresh with a unique setting, I urge you to check out Little's Forbidden series. I haven't been disappointed yet! Oh man. I've procrastinated enough. I think I need to start this series soon. Fantastic review, Christina! I think you'd like this series, Joy! You should check it out. Thanks for visiting! Haha. You crack me up, Jenny! The ending of Forbidden was brutal, but things start to look up for at least a little bit in Banished. I think you'd like this series! Thanks for visiting! I remember you said that before! I agree; the names aren't very Mesopotamian, but it is a pretty unique series if you like historical fiction. You should check it out! Thanks for visiting, Christina!